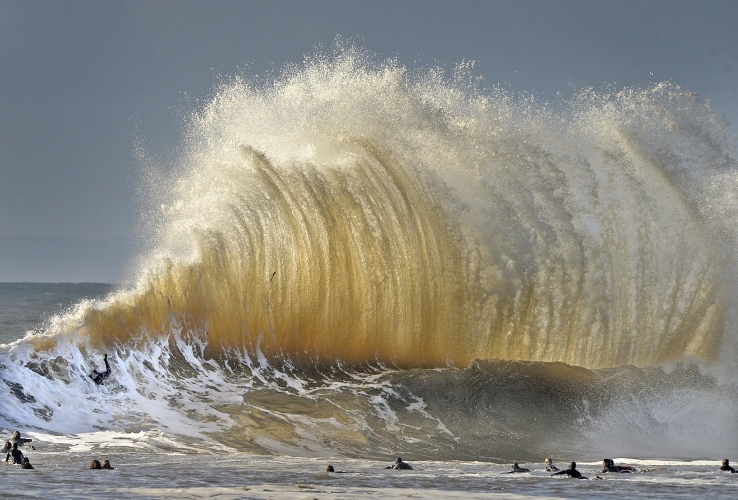 LOS ANGELES — The tail end of a punishing winter storm system lashed California with thunderstorms, hail and severe winds Monday after breaking rainfall records, washing out roads and whipping up enormous waves. At least four people died, three were missing and several others were rescued from raging floodwaters during three storms in four days. Rescuers were set to resume a search for an 18-year-old woman whose car plunged into a rushing creek after a collision southeast of San Francisco. Alameda County Sheriff’s spokesman Sgt. Ray Kelly said recovery efforts were hampered Sunday by dangerous conditions. Heavy snow in the Sierra Nevada mountains triggered an avalanche that shut down a highway just west of Lake Tahoe. Officials warned of continuing avalanche danger at all elevations of the Sierra. In northern Nevada, schools were canceled after more than a half-foot of snow fell near Reno. Flood watches and warnings remained in place for much of Southern California, a day after nearly 4 inches of rain fell south of Los Angeles, inundating roadways, toppling trees and raising concerns about damaging mudslides. Nervous residents moved their cars to higher ground at a mobile home community in Orange County’s Seal Beach south of Los Angeles after heavy rains filled a parking lot to the height of a fire hydrant. One neighbor grabbed a paddleboard and paddled through the lot. Long Beach residents floated on rafts through flooded streets and a helmeted man raced a jet ski through suburban Fullerton. Commuters faced a messy drive to work, with rainfall expected to ease but not end until Tuesday. Motorists were urged to use caution on mountain passes where heavy snow was falling. Long Beach Airport received 3.87 inches of rain by 5 p.m. Sunday, breaking the all-time daily record for rainfall. Los Angeles Airport got 2.78 inches, another single-day record. California has been swamped during a wet winter that has brought plenty of rain and snow after years of drought. A man’s body was found in a rain-swollen creek in rural northern San Diego County, which received more than 2.5 inches of rain. The water was moving so swiftly that crews were not immediately able to pull the victim to shore, according to the Union-Tribune newspaper. Along coastal San Diego, two women were swept into the ocean by a large wave Saturday in Sunset Cliffs. Both were pulled from the water, but one of the women later died at a hospital, Fire-Rescue Capt. Joe Amador said. A motorist in the Los Angeles County city of Pomona died after losing control and smashing into a telephone pole amid heavy rains, according to police. Firefighters in San Bernardino County east of Los Angeles staged a dramatic swift-water rescue of a couple whose pickup truck was trapped in surging water west of the Cajon Pass. Television footage showed rescue crews sending a raft, which was anchored to a fire truck, into rushing brown water so the trapped couple could climb aboard, one by one, from the car’s passenger window. It was one of several similar rescues across the state, leading authorities to warn drivers to avoid roads with even minimal flooding. Traffic was diverted off interstates 110 and 710 south of downtown Los Angeles because of water flowing across lanes. Many motorists were forced to abandon their submerged cars.